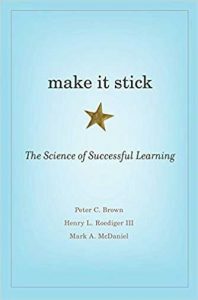 Make it Stick: The Science of Successful Learning by Peter C. Brown, Henry L. Roediger III & Mark A. McDaniel shares with us the surprising results from countless studies on learning and teaching techniques. From a guitar teacher's point of view, the findings from these studies are incredibly useful in shaping how we give guitar lessons and how students should practice. The studies clearly show that a lot of what we think we know about teaching, practice and learning is flat-out wrong. While this book should be essential reading for every guitar teacher, it's a long and drawn out read. While the lessons and insights are incredibly useful, they're spread out across over 300 pages of filler. This summary will condense the book down into it's key findings and explain how they can be used to help your students learn faster and practice more effectively.